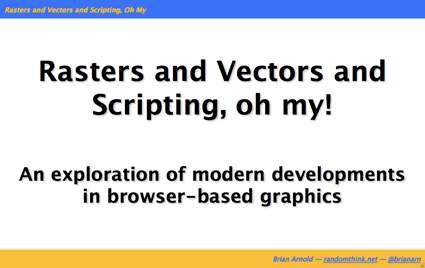 Recap: Rasters, Vectors & Scripting, Oh My! HTML5 isn't a big change from X/HTML 4. HTML5 is more semantic (meaningful), but it is also more flexible. Some of these new, semantic elements for HTML5 include those for <form>s, microdata for datetime, date, time, range, etc. HTML5 gives you more option for richer content via new API elements, including those for geolocation, in-page editing and more. <canvas>, for example, is an HTML5 element that provides a surface that can be drawn upon. <canvas> can be manipulated; rectangles, arcs, quadratic arcs, colors, gradients. You can even use multiple <canvas> elements positioned with CSS to create a layer effect. <canvas>is not a Flash killer. Flash still has its place. It's important to use the right tool. Want interactivity? Consider SVG: each drawing element is a DOM element and interactivity is easier than <canvas>. Brian also provided a number of HTML5 resources and demos. Be sure to peruse his deck for links.